This week, I've got the honor of discussing Judge Death: The Life and Death of... with David Brothers of 4thletter! DOUGLAS: David asked me for some background on how exactly this volume fits into the Dredd-matrix, so here's my statement of context: this is a weird goddamn book. The Life and Death of... is sort of the missing half of Death Lives, which came out at the beginning of the Simon & Schuster/2000 AD program in 2010. And the reason it's a companion piece is that John Wagner has been very very careful about not overusing Judge Death, but maybe not quite careful enough. 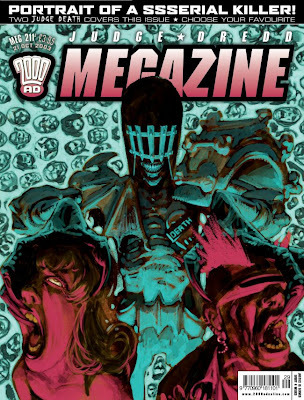 For a character who's central to the way people think about Dredd, Judge Death has had relatively little on-panel time--he's not like the Joker or Lex Luthor or Magneto, popping up twice a month. 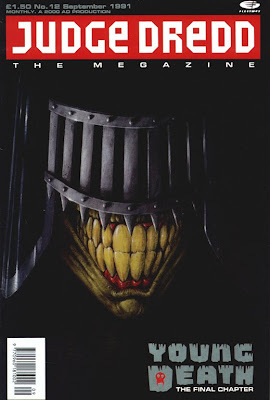 After his first two, brief, Brian Bolland-drawn appearances, in 1980 and 1981 (both in Death Lives), he appeared in a Judge Anderson story in 1985, then wasn't seen until the long "Necropolis"/"Theatre of Death" sequence in 1990. (There's also a ten-page story from 1991 that's a flashback to "Necropolis"; I'll get around to that in January, I believe.) In all of those appearances, he's a figure of total terror; he and his associates slaughter (many) millions of people over the course of "Necropolis," and the moment where he shows up in that story is really where the hammer comes down. 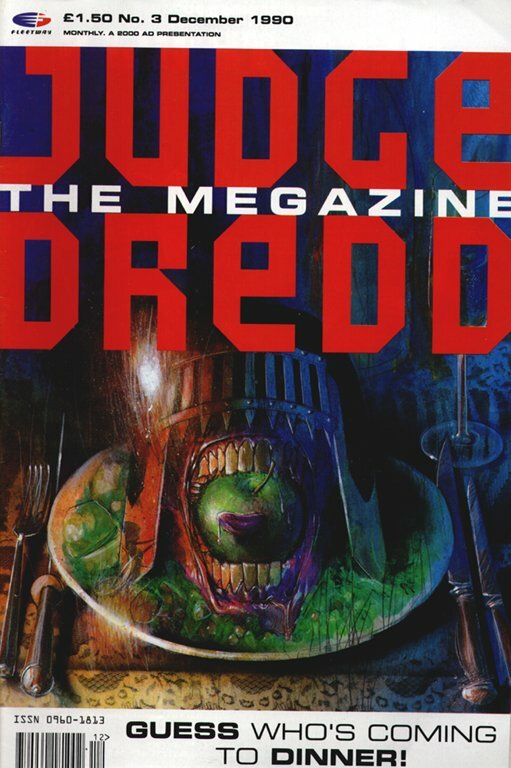 "Young Death," the first story included here, was serialized over the first year's worth of Judge Dredd Megazine, which launched immediately before the end of "Necropolis." As you can see, it sort of transformed Judge Death into a sitcom character, "Mr. De'Ath" with his ridiculously uncomprehending landlady. 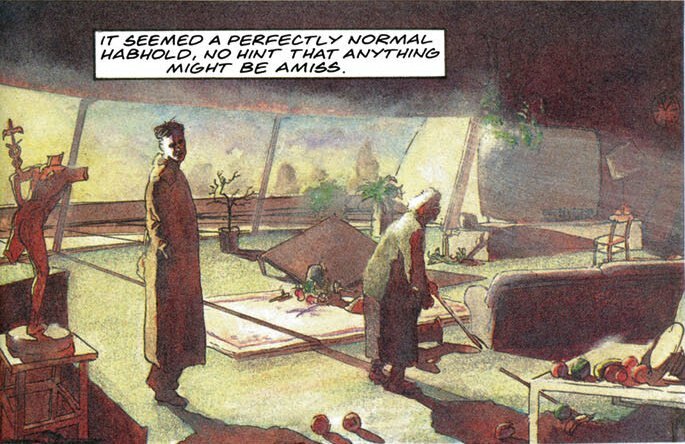 Incidentally, if it's unclear how he went from "still at large" at the end of "Young Death" to "in captivity" as of "Tea with Mrs. Gunderson," that's because of a curious aspect of the Judge Dredd intercompany crossovers: they're all in continuity. 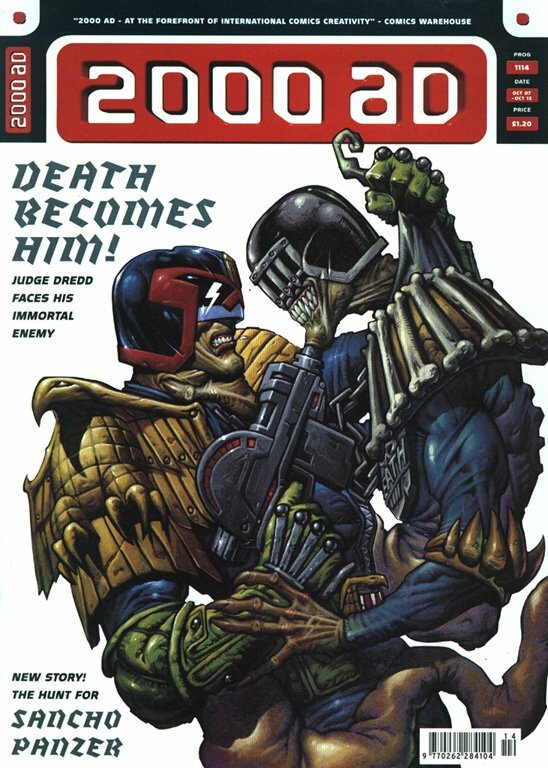 Anderson captures and confines Death at the end of the first Batman/Judge Dredd one-shot, Judgement on Gotham, which came out at the end of 1991, shortly after the end of "Young Death." For the past decade, we've seen relatively little of Judge Death. The two long black-and-white stories here that Frazer Irving drew, from 2002 and 2003-2004, respectively, are just about it, aside from a Judge Anderson story, "Half Life," that ran at the same time as "The Wilderness Days" and got her out of her coma. (I haven't read it.) The end of "The Wilderness Days," in other words, is the last we've seen of him; we don't see a body or anything (as if we could), but it does seem at least moderately final. That has to be by design: Wagner has indicated that he's done with the character. The problem with Judge Death is that there's no way to effectively de-escalate the scale of his stories. His first four appearances were each increasingly huger and scarier--"Necropolis" is maybe where the series' stakes feel highest ("Judgement Day" has a higher body count, but less of a sense of the roof falling in). After that, any straightforward follow-up would have just been a lesser duplicate of "Necropolis," so there was nothing left to do with Death except examining his wake and burlesquing his scariness. Wagner did both of those nicely for a while; he's very good at burlesquing things, including his own work. But I think he's decided that, as much as readers love Judge Death, he's gone as far as he can go. So I haven't even talked about the actual comics in here yet (as a trick to make you talk about them). What's your take, David? DAVID: Douglas, weird is the perfect word for the book. I picked up The Life and Death Of... expecting to read a few short tales of skin-crawling terror or overt horror. 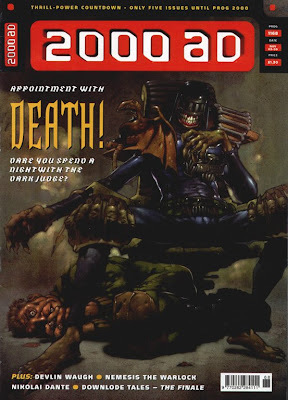 I've read a few Judge Death stories, and he always came across as the ultimate in bad guys, a nuclear apocalypse in the form of a man. Not so much a character that you could dig into as a (pardon the cliché) force of nature. When he arrives, things go south, and there's nothing anyone can do about it. His presence should seem like a big deal, and The Life and Death Of... feels like it exists solely to deflate that aspect of his character. I think the parts of the book that work the best are the ones that hearken back to the really scary aspects of Judge Death. I quite liked "Death Becomes Him," and particularly Gary Caldwell's strange, muted palette. 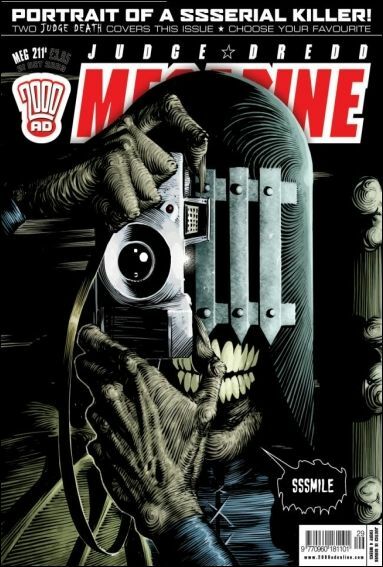 I like the idea of Judge Death as an infectious agent, something that poisons everything he touches and whose influence is felt long after he's gone. It's a creepy little idea, and one that's pretty well-executed here. The last page of "My Name Is Death" is fantastic, too. It's successful in a way that I never really saw in the rest of the story. Judge Death tearing through a juve home should have been much scarier than it was. Instead, it felt kind of rote, as if Wagner and Irving were going through the motions to set up a story down the line. But again, that last page, with Death walking the Cursed Earth and quietly going about his business, is exactly what I was hoping to see. I think the weirdest part of this book is how "Young Death" seems like it should change Death from a flat character to more rounded one, but that transition never really happens. Not that I can tell, at any rate. We get Judge Death's origin and we see him out of sorts, and those moments are normally used to reveal secret truths about a character. Instead, they just confirm what we already know. Yep, he's evil. Always been evil, ayup. He hates torture, yessir, except when he doesn't. (Which was another weird thing about the book--Death contradicts himself when talking about how he feels about torture for some reason.) There aren't any revelations here, just confirmations. Those confirmations take some of the air out of Judge Death's sails. When his past was mostly unknown, he was scary. The more they reveal the reasons for his actions, the less scary he becomes. He went from flat force of nature to flat absurd character. I feel like I'm criticizing the book for the wrong reasons ("It's not scary enough! Why are these stories so funny?! "), but Judge Death's transformation into a sitcom character in "Young Death" is a tough one to reconcile. I like the idea that Judge Death wanted to teach people about his goals in the hopes that they would convert to his cause and presumably join some type of Death cult. That idea was buried under the increasingly ridiculous scenes of Sidney Death's origin and a few tired sitcom landlord/old lady jokes. 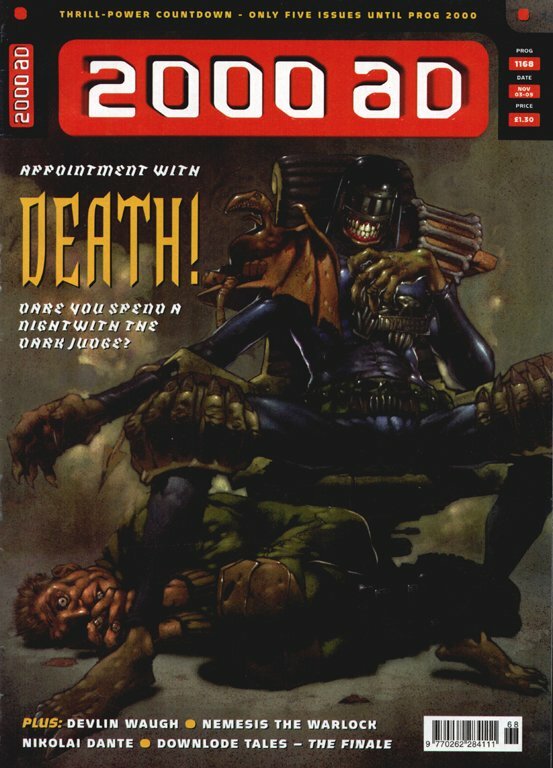 I mean, Judge Death bumming rent money--it's a bit much, right? It's hard for me to buy this Judge Death as the same one that turned Mega City One into a Necropolis. He's missing the eagerness and willingness to kill that made him a real threat. The Life And Death Of... is particularly interesting in light of your comments about Wagner being tired of the character. The publication timeline is a little too long for this to be true, but the majority of the book feels like Wagner's attempt to bury his own character. "Death Becomes Him" is the sole exception, I think, but the others, with their sitcom antics and Las Vegas boxing, feel like attempts to turn Death absurd, rather than scary. You have a good point with the burlesque aspect of things, but I think Wagner actually takes it into the area of killing Judge Death's credibility. Death comes across as a joke, or at least an object of mockery, in most of these stories. All of that is intentional, sure, but it feels like a burial, rather than simply a series of jokes. "I'm sick of this character, but you guys want him... do you want him now?" Am I totally off-base there? I think you're correct in saying that using Judge Death as he was in "Necropolis" would have just been diminishing returns, and that colors my opinion of these stories. Is it better to fade out and turn into a parody of yourself like the Joker or just to fade into the background? Wagner chose a third route, something like "This guy is actually pretty silly, so we're not going to play him straight any more." I think "Death Becomes Him" and parts of "My Name Is Death" hit me the hardest, and "Young Death" was pretty entertaining. Was your experience similar? DOUGLAS: As far as writing goes, "Death Becomes Him" is my favorite thing here--one thing Wagner does incredibly well is write about how the way major events are understood changes as they recede into history. "Death Becomes Him" is eight years out from the end of "Necropolis," seven years from the end of "Young Death"; Judge Death is understood as "an awful thing that happened a while ago," and his image has turned into a tourist attraction, something to scare the rubes with--but his presence, and what he actually did, is so horrible that it still lingers and corrupts everything that happens where it was. "Infectious agent" is exactly right. "A Night with Judge Death" makes the same point considerably less effectively. (It does highlight another way that Judge Dredd likes to play with the ramifications of big events--the "Second Robot War" it mentions was part of the lengthy "Doomsday Scenario" storyline that had ended a couple of weeks earlier.) And I just realized that the episode that ran the following week also had a final scene set at Mrs. Gunderson's place: I don't think it's ever been reprinted, but Wagner's script for it is online. And while I don't think I could handle Mrs. Gunderson very often, I do like most of her scenes with Judge Death; I like the idea that she survives everything just by being cheerful and completely oblivious to what's going on. Which is why "Tea with Mrs. Gunderson" really doesn't work at all for me. If his whole routine is "the crime is life, the sentence is death," then he can't exactly find her innocent, can he? "The Wilderness Days" seems really off-kilter, too: I agree that by that point it's Wagner saying "do you still want him now?" The "Natural Born Killers" parody never even starts to find its footing; the vaguely "Dr. Strangelove"-ish ending doesn't really connect either, and having Death dragged off to hell by one of Wagner's Cursed Earth central-casting hillbillies is dopey and unconvincing. "You cannot kill what does not live" is a great catch-phrase, but it also means there's never a real threat that the character can be taken off the board for keeps. I really like the look of Alex Ronald's artwork in "Death Becomes Him," too--it's much less dramatic than Irving's, but fragile and sooty in a way that suits the story (and I agree with you that the coloring's on point there). 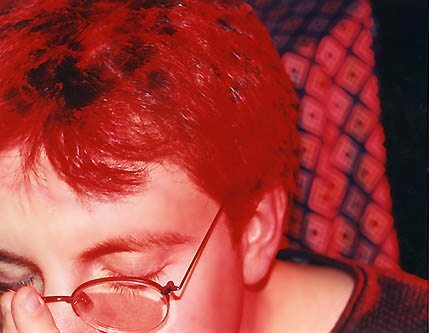 Peter Doherty's work on "Young Death" is very odd: really gorgeous color and textures that cover up for figure work that's a little bit iffy. According to this interview with him, it was actually his first professional assignment as an artist, and you can tell he's working out a lot of what he's doing as he goes along--the scene with Sidney's dog looks a lot like Sam Kieth's stuff to me. Really, in general, the artwork in early-'90s 2000 AD and Megazine looks a lot better and livelier to me than most of the American comics that are coming out now. I gather from Thrill-Power Overload that the budget for the early Megazine was pretty high by the standards of the time; I wonder if the only difference is page rates, or if there was actually a broader range of styles that was acceptable for that time and place's idea of "mainstream comics." Did anything in particular strike you as interesting about the look of this stuff? DAVID: I think the most interesting thing about the art is how varied it is. 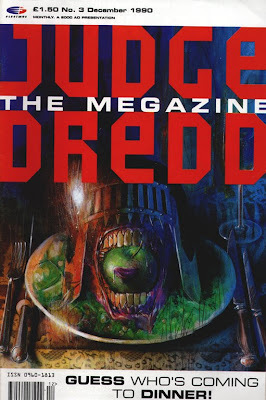 Which is kind of an ignorant thing for me to say, particularly in light of the fact I own a couple of the Mega-City Masters volumes, but when I think of Dredd and Dredd-related material, my mental image always goes to Carlos Ezquerra or Steve Dillon first. It's like how the name "Spider-Man" conjures Steve Ditko, John Romita Sr., and then Todd McFarlane first and foremost for me. So the diversity of art in this collection was a pleasant surprise for entirely banal reasons on my part. I quite liked seeing Dean Ormston colored like Simon Bisley and black and white art from Frazer Irving. I was expecting to like Frazer Irving's half of the book the most. I was introduced to his art on Silent War, his strange and beautiful collaboration with David Hine during Civil War-era Marvel, and I've greatly enjoyed what he's done since, from Gutsville on through to Xombi. In the end, though, I was most impressed by Alex Ronald on "Death Becomes Him." The dry and dusty palette fits Ronald's stick legs and realistic faces very well. Things like Chuck Quite's kind smile in Quite Nice Bar or Giff attempting to calm down after freaking out that first time were very well done. Irving's black-and-white art took some getting used to. I had a little trouble with the storytelling in a panel here and there, but once I adjusted, I found a lot to enjoy. There's a very good panel partway through "My Name Is Death" that appears just after Death wipes out the first dorm. Judge Caldero discovers Death on the linkway, and Irving renders Death as a shadow among shadows in the gloom of the fog. Death is obviously humanoid, but the darkness intersects his body in such a way that the shadows almost seem to emanate from him, rather than from the night. And the next panel--Caldero's Riot Blaster shot is drawn as two straight lines, but the light source Irving throws on the image makes the shot look like a huge and messy laser blast. It lights Death up in a very cool way, too. His badge and the bones on his shoulder pads are crystal clear. I'm wondering if these were originally printed on glossy paper. I'm curious to see how they'd look on something more coarse and matte. The visual contrast between "My Name Is Death" and "The Wilderness Days" is fascinating. They feel like two sides of one coin, with "My Name Is Death" being dominated by black and "The Wilderness Days" being mostly white. Daytime versus nighttime, essentially. But Irving uses a few techniques in "The Wilderness Days" that I enjoy quite a bit. He sketches out the idea of clouds, smoke, speed, and a lot of other things with these harsh, thin, uneven, and kinda-sorta straight lines. The two pages beginning with Hocus Ritter leaving his son at a homestead were particularly effective. The graves are made of lines that are thicker at one end than the other, creating the illusion of a curve, the ground is a loose collection of roughly parallel lines, and shadows are just slightly off that same parallel. Most of the lines are the same weight, especially on the next page, but Irving still manages to use angles and the ghost of shapes to get across exactly what he wants to portray. 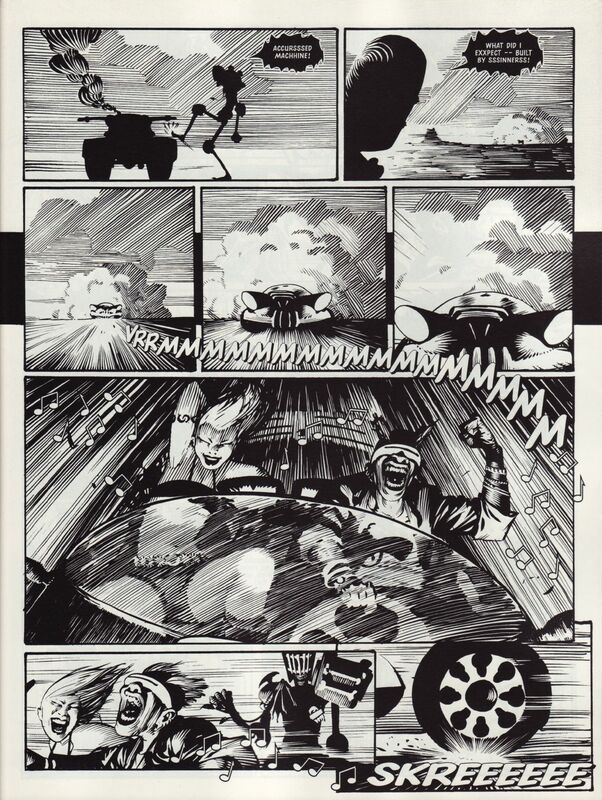 I especially like how the windshield on the natural born killers' car sits in contrast to the rest of that panel. Quick sidebar: Judge Death kicking a broken four-wheeler and then hitchhiking with a smile is another dissonant sitcom moment, another strip of menace pulled right off the character's back. I almost can't imagine Irving's pages in color. They're clearly by Irving, but they feel so different that I can't see his palettes over the top of them. They seem like they'd only work as black and white pages, considering the way he uses light and shadow. This isn't a complaint, of course. I'm just trying to reconcile this Irving with the Irving of, say, Batman & Robin. I absolutely agree with your assessment of Peter Doherty's "Young Death." The two-page sequence where Brian Skuter enters Gunderson's apartment and meets Jay De'Ath is fantastic. It's colored like a sunset, with bright yellow fading to reddish-orange and then on down to black. In fact, the reddish panel where Skuter inspects the habhold is very impressive. There's a bit of green on the floors and a light purple in the sky. I like the coloring in this one much more than the line art, which I found pretty shaky. I found another interesting point from that interview--Doherty colored Darrow's Shaolin Cowboy! I quite liked how that series looked on about every possible level, so that was very cool to see. It's sort of funny that the story I liked the least looked the most like an American comic from the Marvel Knights era, an era that helped bring me back into comics. Andy Clarke and S. Baskerville's work on "A Night With Judge Death" reminded me entirely too much of the story early on in Brian Michael Bendis's run on Daredevil that featured art from Manuel Gutierrez and Terry & Rachel Dodson. Something about that story felt very fake and plasticky, and the same holds true for "A Night With Judge Death." It doesn't feel like it fits in with these other stories, despite the disparate art styles already on display. DOUGLAS: I'm right there with you! 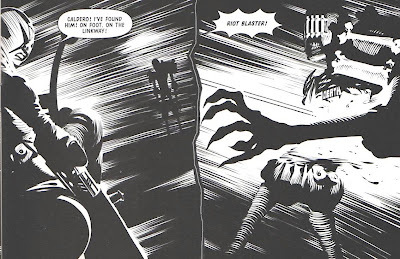 As far as the range of styles on display... there's always been a pretty broad visual range in Judge Dredd stories proper, but there are also some drawing styles that don't seem to work as well for the main series. 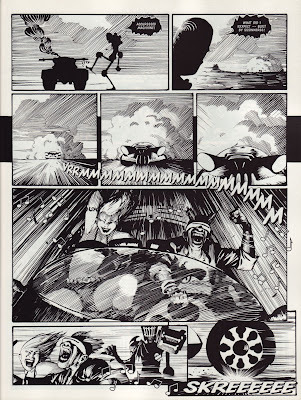 I can't see the kind of ultra-stylized, whole-bottle-of-ink technique Irving uses to such impressive effect here working for an actual Dredd serial (although he does seem to modify his style for every project he works on--and I'll second your cheers for Hine and Irving's Silent War). I'll also note that Doherty's been Darrow's regular collaborator for a while--you can see how their styles have merged a bit in this recent Dredd sequence--and that he went on to draw a bunch of Dredd material, including one of the best-loved stories that's never appeared in a book, "Bury My Knee at Wounded Heart." Thanks again to David for joining me this week. Next week: Alyssa Rosenberg and I discuss America, which may be my favorite Judge Dredd-related book to date--the collection of the first three serials about the doomed romance of Benny Beeny and America Jara, and what came of it. Thanks guys, this was top notch. Do you intend on reviewing Death Lives at some point? Tomorrowboy: yes, that's scheduled for May, thanks to my ingenious "all books in order of earliest story we haven't covered yet" scheme. It just seemed kind of strange, because some of the stories happen before the stuff you're reviewing here. I guess that's the problem with the themed collections. Anyway, keep up the good work!